December 29 Update: The December 26-27 snowfall map (click to enlarge) from the National Weather Service shows that the bullseye of the storm was in the northern New Jersey/New York City metropolitan area. 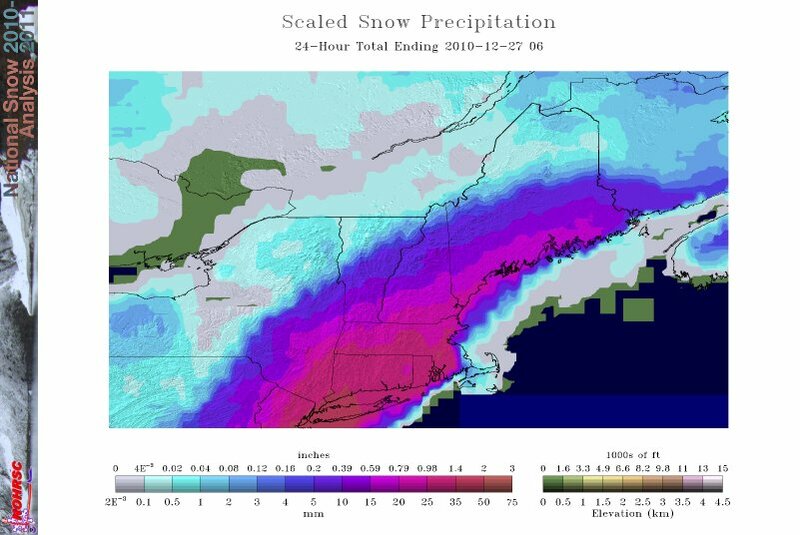 The Eastern Coastal and Northeast maps of 24-hour liquid equivalent for frozen precipitation show the heaviest amounts near and along the coast. 2 PM Update: At 7 am EST this morning, as the center of the Northeast blizzard was passing close by, Nantucket reported a barometric pressure of 28.46" and falling. This was just slightly above the all-time mainland U.S. pressure record set just a few months ago in Minnesota. 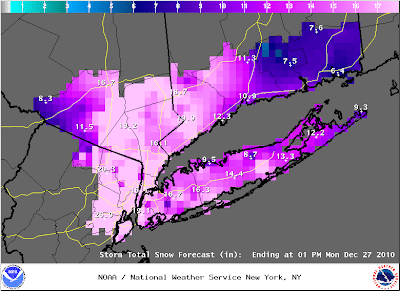 Noon Update: The images below (click to enlarge) from the National Weather Service show forecast storm total snowfalls from Delaware through New Jersey, Long Island, and southern New York and Connecticut. LINCOLN PARK          29.0   800 AM 12/27  DRIFTS OVER THREE FEET. Image (click to enlarge): Surface weather map for 10 pm EST, December 26, 2010, shows a low with minimum pressure of 972 mb (a drop of 19 mb in 12 hours) centered south of Cape Cod. By 1 am Monday, pressure at Martha's Vineyard MA was down to 974.4 mb and at Montauk NY was 974.2 mb. 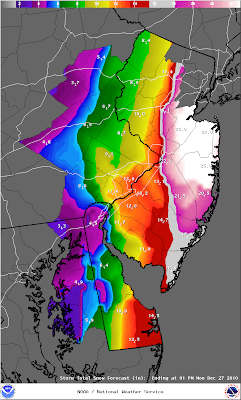 6 PM Update: Washington National has had a total snowfall of a trace as of 6 pm, despite reporting light snow almost continuously since 11 am this morning and also despite rampant hype-ocracy for days from the commercial media. 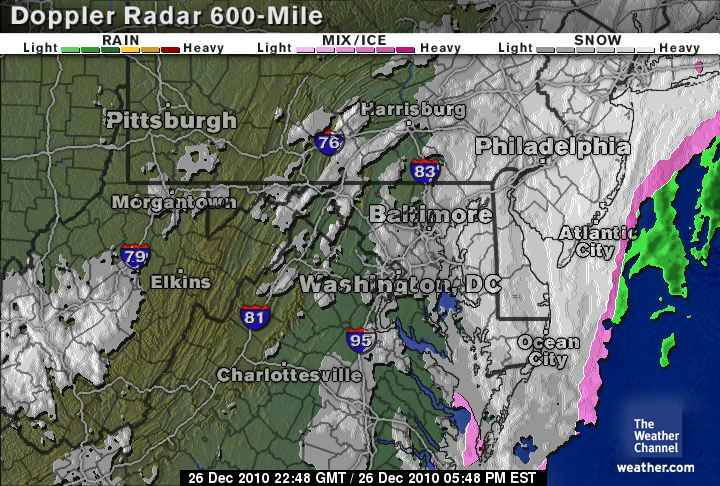 As the storm moves away toward the northeast, as shown in the radar image from The Weather Channel, the highest snowfall amounts reported in the region are around 5" at 2 locations in St. Marys County in southern Maryland. The daily total for Richmond has been corrected to 3.8" (0.7" of the storm total fell before midnight last night). The Norfolk total has increased to 12.5". 5 PM Update: The 12.0" of snow reported at Norfolk as of 3 pm today breaks the old record for December 26 of 5.0" set in 2004. The 4.5" 3.8" reported so far at Richmond breaks the old daily record of 3.5" set in 1917. 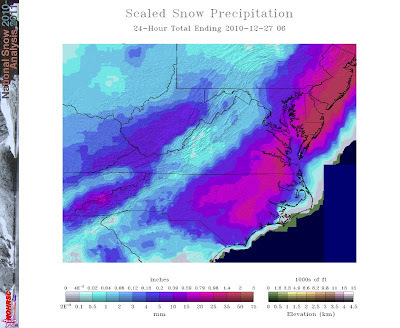 The highest storm totals in southeastern Virginia as of 5 pm are 13.2" at Smithfield, in Isle of Wight County, northwest of Norfolk, and 14.0" at Yorktown. Today's low temperature so far of 28° at Richmond is 1° lower than the average for the date of 29°, but well above the record of 5° in 1980. The map to the right shows the average temperature departure from climatology for December 1-24 in the U.S. The Christmas snow across parts of the southern U.S. set several records for the date. Overall, 12 daily snowfall records were set in the 6 states of the Southeast Regional Climate Center (Virginia through Alabama). The total number of daily low temperature records reported by the National Climatic Data Center in the entire contiguous 48 states from December 20 through 25: zero. Here are some of the Christmas records compiled from National Weather Service reports. The 0.4" at Raleigh tied the record for December 25 set in 1947. Raleigh has also reported a trace of snow on 9 other occasions since records began in 1944. The greatest depth on the ground for December 25 was 1" in 1966. Piedmont-Triad (Greensboro) had 4.2", which broke the old record of 2.8", also set in 1947. The 6.5" at Asheville broke the record of 5.4" set in 1969. The low temperature of 32° at Raleigh was 1° above the average for the date and nowhere near the record of 4° in 1983. The low temperature of 28° at Asheville was also 1° above the average for the date. The record low of -7° was set in 1983. The 1.6" at Greenville-Spartanburg edged out the 1.0" in 1962, but was less than the record of 2.0" in 1947. At Macon, the 0.1" was the first measurable snow ever recorded on December 25. The 2" at Athens broke the old record of 0.2" in 1993. The 1.2" at Atlanta was the first measurable snowfall on Christmas since 1882. The most recent trace of snow at Atlanta on the date was in 1993. In all, Atlanta has recorded a trace of snow 13 times on December 25. The Atlanta record low temperature for December 25 was 0°F in 1983. This year the low was 31°, barely enough to support the snow which fell. The records for the date at Macon and Athens are 7° and 3°, respectively, also set in 1983. Huntsville measured 4.5" of snow on Christmas, smashing the old record of 0.3" set in 1989. The 1" of snow at Anniston was the first measurable amount on December 25 since records began in 1903. The low temperature of 30° at Huntsville was just 2° below average and 31° above the record low of -1° in 1983. The estimated 1.4" reported at Tupelo was the first measurable amount of snow on December 25 in records which began in 1930. The last time a trace was reported was 1989. The low temperature at Tupelo of 33° was 1° above average and 33° above the record of 0° in 1983.